an old man said to me, 'won't see another one'...."
In the early 1980s, well past the growling death knell of the original punk movement, the so-called new music scene had already made the shift toward its impersonal synthesizer period, where drummers were replaced by machines and any band who could fiddle with nobs were releasing singles. It was at this critical crossroads that The Pogues first appeared, a ragtag mix of hard-drinking Irish and English musicians who played a blend of traditional Irish folk music tempered with an undeniable and raw punk spirit. The nine-piece band, led by the self-destructing Guinness-laced swagger of transplanted Dubliner Shane MacGowan, not only played songs based on traditional Irish ditties, but did it with such non-rock-and-roll instruments as the mandolin, accordion, dulcimer, tin whistle, banjo, spoons, and concertina. MacGowan penned nearly all of The Pogues' original songs, and he is the subject of this new documentary from Sarah Share, which tracks his roots on through his inevitable dismissal from the band in 1991. There are ups and plenty of downs, and in some ways this is like an extended Behind The Music episode, though to compare it in that simply is rather insulting. If I Should Fall From Grace (which takes its title from the third album by The Pogues) doesn't use any formal narration, but relies on assorted comments from MacGowan as well as his parents, his saintly girlfriend Victoria Clarke, The Pogues' Philip Chevron and the gloriously gloomy Nick Cave, alternatingly intercut with footage of the band performing and portions of their seldom seen music videos. Over the course of ninety minutes, Share manages to sufficiently trace MacGowan's (and The Pogues) meteoric rise but, more importantly, she allows her camera to linger on her subject as he carries on with a series of wild-eyed and alcohol-fueled guttural rambles. The volatile and wiry MacGowan, with his mouthful of missing and disjointed teeth, was easily the focal point of The Pogues, a fact that eventually contributed in some small part to his eventual firing. His skill as a songwriter is presented in no uncertain terms in this documentary, a fact that is even more remarkable considering that it seems that MacGowan is seemingly never sober. Though MacGowan calls them simply songs about "drinking, fighting and f***ing", the reverential comments from such high-profile artists as Nick Cave (a guy who really knows how to write a song) are more than telling. As a huge fan of the band, I found this this documentary to be extremely enjoyable, especially considering that The Pogues never achieved much stateside success, despite having created a veritable Christmas classic in the darkly romantic Fairytale Of New York. MacGowan comes across much as I expected him to: wildly hard-drinking and undeniably poetic. Image Transfer Review: The documentary is presented in a nice-looking 1.85:1 anamorphic widescreen transfer. The new interview material shot by Share looks very good, with well-rendered colors and evenly balanced fleshtones. Black levels are not particularly deep, but suitable for the presentation. Some of the early material, culled from a variety of different sources, looks a little uneven and grainy in spots (some of the older music videos especially), but the footage captured by Share is clean. The overall transfer is more than adequate and presentable for a documentary, which rarely look as processed and refined as feature films. Audio Transfer Review: Considering that most of their releases are music related (and most of their audio transfers are fairly poor), this one stands as one of MVD's better audio transfers, offering both 5.1 and 2.0 surround tracks. If it's a choice, go with the 5.1, as it dramatically fills out the soundfield. Voices sound crisper and deeper, and the wonderful music from The Pogues sounds much larger in comparison. The 2.0 track is noticeably flatter, with a less pronounced dynamic range. Extras Review: The extras include a set of seven Deleted Scenes (24m:12s) that feature a comically drunken ramble about Christ from MacGowan (as gal pal Victoria Clarke patiently fills notebook pages with his comments), as well as MacGowan and Paul Simonon from The Clash sitting in a bar talking about Sergio Leone and spaghetti westerns. Nick Cave offers a few more glowing comments about his friend, and the set concludes with MacGowan, gin bottle in hand, urinating on some hedges. For fun, there is also a Sing-A-Long section that provides on-screen lyrics so that you can sing along to Waxie's Dargle, The Irish Rover, and The Woman Got Me Drinking. Whiskey not included. The disc is cut into 17 chapters, and does not feature any subtitles, which with MacGowan's thick-as-Guinness accent, is not always a good thing. Few bands exuded the vibe to drink and drink heavily as much as The Pogues. If listening to one of their songs didn't make you crack the seal on a bottle of whiskey, you were a much better man than I, to say the least. 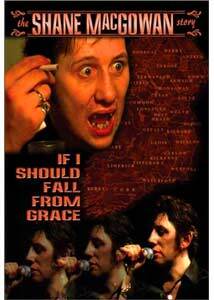 Sarah Share's documentary on the life of Shane MacGowan is not always complimentary to its subject, but if you are a fan of the man and the band, this is essential material; even more importantly, it is crammed to the rim with a historical cross-section of songs from The Pogues.